Colorado Criminal Law - Understanding Criminal Mischief 18-4-501 - Denver Criminal Attorney Specializing in Domestic Violence Cases - Colorado Criminal Defense Lawyer. Colorado Criminal Law – Understanding Criminal Mischief 18-4-501 – To understand the Colorado Crime of Criminal Mischief – as in all Colorado criminal charges – you must start with the law itself. (1) A person commits criminal mischief when he or she knowingly damages the real or personal property of one or more other persons, including property owned by the person jointly with another person or property owned by the person in which another person has a possessory or proprietary interest, in the course of a single criminal episode. …if one is charged with this crime – the focus is on the value assigned to the damage caused. (h) A class 2 felony when the aggregate damage to the real or personal property is one million dollars or more. 5. in the course of a single criminal episode. The requirement of damage – the damage “element” of the crime of criminal mischief arises out of the economic loss caused by the “knowing infliction of damage tothe real or personal property of another.” This is an “essential element” to prove the crime. The salvage value of the article. Of, during the course of a criminal mischief trial – the parties dispute the value of the article damaged and the evidence conflicts on that subject – the jury is given what is called an “interrogatory.” The interrogatory or questionnaire asks the jury to specifically find the value from the evidence produced during the trial. in Colorado domestic violence cases – criminal mischief – as an act of domestic violence – is often charged based on their destruction of the victim’s or jointly – community owned property. To understand “community property” one needs to understand that each owner has an equal ownership interest and, although undivided, Colorado criminal law protects from the unilateral and “non-consensual” damage or destruction by the other marital partner. In Colorado if one causes “bodily injury” but not serious bodily injury and no deadly weapons are involved – the charge is third degree assault – a misdemeanor. But if the accused damaged the property of the victim – the value of the damaged or destroyed property can take the crime to felony levels. LINK Today a large flat screen TV easily makes this felony level and can launch was only a minor injury to the victim into District or Felony Court. To be guilty of the crime of criminal mischief you must “knowingly” commit the crime. That means you cannot negligently or even recklessly commit the crime of criminal mischief. So if your son is playing football in the street and he lands – accidentally – on the neighbor’s car – this cannot be criminal mischief because it was an accident. Colorado’s criminal mischief law does NOT include recklessness. This is important because many situations in – for example Colorado Domestic Violence cases – result in damage to property that was never intended. (c) purposely or recklessly causes another to suffer pecuniary loss by deception or threat. You must make a responsible choice for a Colorado Criminal Defense Lawyer – we encourage you to look at our firm. Over the last 30 plus years – H. Michael has mastered nearly every area of criminal law, procedure and trial and courtroom practice and he is passionate about getting you the best result in your case. He has written and continues to write extensively on Colorado criminal law and he hopes this article – – helps you in some small way. 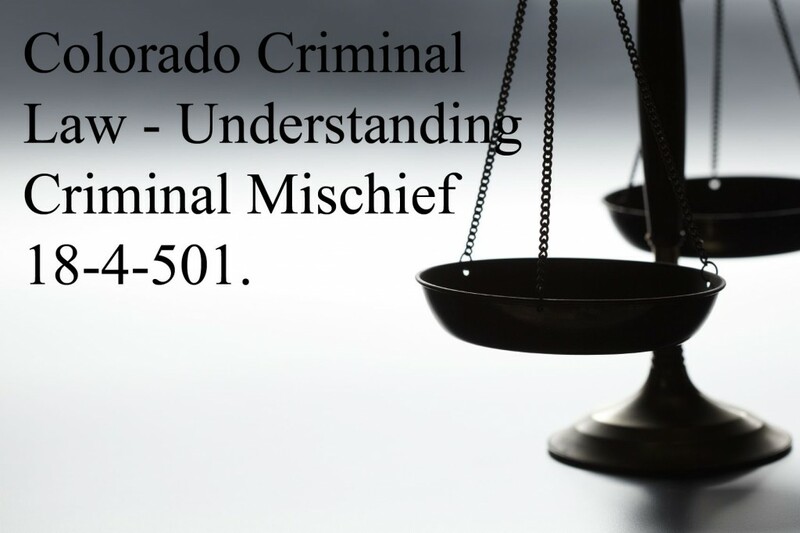 H. Michael hopes you found this page helpful – Colorado Criminal Law – Understanding Criminal Mischief 18-4-501. To understand the Colorado Crime of Criminal Mischief - as in all Colorado criminal charges - you must start with the law itself.